If you feel like there is nothing more exhausting than pretend play, you’re not alone! Most of us have long since lost the desire and energy to create an imaginary world within our daily lives. We have too much on our minds and too much to accomplish in a day to spend hours recreating the story of Cinderella or fighting imaginary fires. But should we be doing it? Sorry, but yes! Why? Because engaging in pretend play at home with our kids is powerful stuff! Pretend play naturally develops empathy, language and communication, self-control, and initiative in learning. It builds a strong and trusting bond with our child. Besides that, it’s free, always available at our fingertips, and even more enjoyable to children than time in front of a screen. And the truth is that encouraging imaginative play doesn't need to take hours of time or a ton of energy. Imaginative parenting can literally be done in 5 seconds per day. A single 5 second response to your child can spark an avalanche of creative thinking. And those 5 seconds can give you both an energy boost that only comes from a fun interaction between parent and child! We call it Emotion Matters and you’ll be surprised by how stimulating to the imagination this tiny change can be. In over 15 years of delivering Pyjama Drama classes, Pyjama Drama Learning’s cofounders have found the secret to easily creating powerful pretend play scenarios with children. It’s that single ingredient that will pique any child’s attention and spark creative problem solving - emotion, so the next time your child approaches you with a pretend play offer, try to return it with a change in your emotion. Can you imagine how the scenarios above might lead to more advanced pretend play, not to mention conversations, creative problem solving, and empathy? 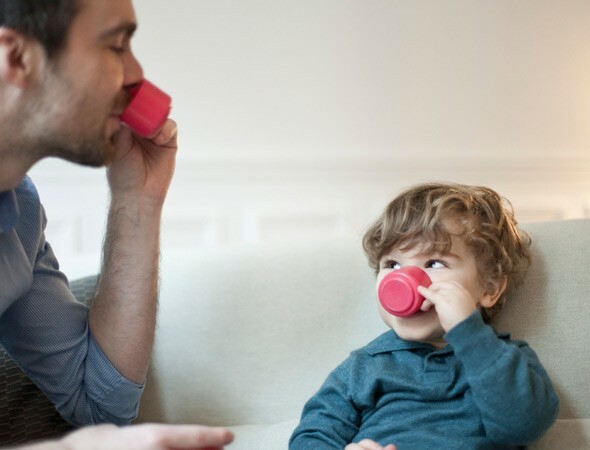 Your single, 5 second, emotion-charged response might be enough to give your child a new direction in their pretend play, leaving you to unload the dishwasher knowing they are busy building their brains. Or, if you’re like me, it might be enough to make you chuckle, to shake up the scenario, and actually make you want to play along a little longer. Try out a change of emotion with your little ones today. Let me know how it goes! Looking for more imaginative play tips and resources? Want to see Emotion Matters in action? Try out our free course, 5 easy ways to use drama in your preschool classroom!